For more images and video of the monocopter in flight, see the press release online. Maple tree seeds (or samara fruit) and the spiraling pattern in which they glide to the ground have delighted children for ages and perplexed engineers for decades. Now aerospace engineering graduate students at the University of Maryland?s Clark School of Engineering have learned how to apply the seeds? unique design to devices that can hover and perform surveillance in defense and emergency situations. "Natural maple seeds usually trade off altitude for rotation as they fall to the ground," said Evan Ulrich, one of the graduate students on the team. This altitude-rotation trade-off results in the power that the seeds need to travel. But this traditional design does not provide enough power to allow the device to hover. 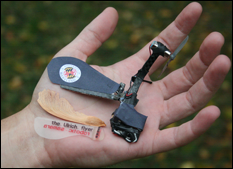 The Clark School researchers made use of research and testing techniques developed at the school's Alfred Gessow Rotorcraft Center to develop the maple seed-inspired device. The aerodynamic and geometric properties of natural samara were studied in detail. The insight gleaned from this study enabled the creation of the world's smallest controllable single-winged rotorcraft. The vehicle has been demonstrated at University of Maryland events, the American Helicopter Society Annual Forum, the Smithsonian Udvar-Hazy Air and Space Museum, and at the 100th anniversary of the College Park airport.